I love Spa Week. I really, truly do. I never miss the chance to book my $50 facial or massage when their bi-yearly offers roll around. So yesterday, I was wide-eyed and all smiles at their kickoff even at the Midtown Loft and Terrace on Fifth Ave. My sister-in-law’s sis, Uzma, is in town (that’s her below! 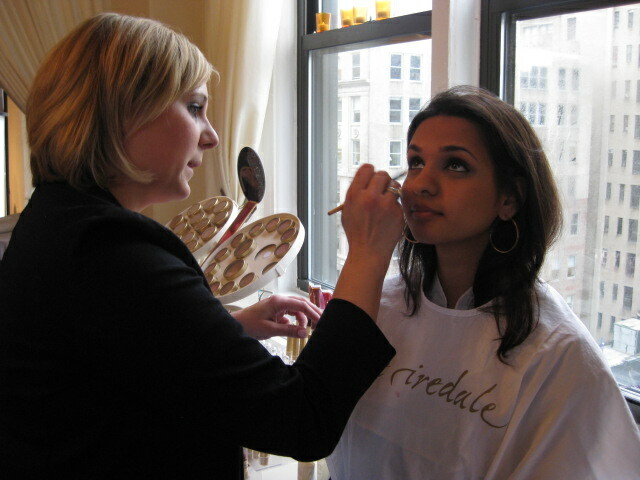 ), so we took full advantage, starting with getting our faces did with Jane Iredale’s makeup. The line is mineral-based, chemical- and dye-free, so it’s great for sensitive skin types, like mine. Uzma and I both loved their talc-free Purepressed Base with SPF 20 ($49.50). I swear it felt like they used barely anything, but it still evened out our complexions. They used the shade Riviera on me and Latte on Uzma. My buddy aka Hero aka Life Editor, Katie, joined us later and got a hand massage, which I skipped only because Uzma and I were in line for our manicures (more about this in a post coming up!). And finally, we got one of the most amazing foot massages by the people from Homme & Femme Spa. It just felt like I was given a brand new pair of feet to walk on after (actually nevermind, that sounds creepy, but you know what I mean). I checked out their website after, and their prices aren’t that bad either. Must book next appointment there. Spa Week runs nationwide from April 13th – 19th. Are you going to book anything for this auspicious week? Any recommendations? I want to know your favorites! Hahahah, omg when were you here? I was there at like 7:00!! Def didn’t do the manicures, but I ate lots of fruit and pound cake with fondue!